The hopefully named Radio Free Europe reports that up to $4 billion are coming Serbia's way from the UAE in the latest Western installment of doling for dollars. Small wonder Belgrade has agreed to meet with Kosovo officials to discuss "normalization" with its erstwhile province, despite its declarations that "Kosovo is Serbia" forever. The screws (continue to) turn. Andrew C. McCarthy, who successfully prosecuted Abdel Rahman, the "blind sheikh" who masterminded the 1993 attack on the World Trade Center, poignantly reflects on how it is that two decades of jihad have failed to prod the West into acknowledging and confronting the specifically Islamic brand of war, part-violence, part-subversion, that is leading to our demise as a civilization through the strangulating imposition, both de facto and de jure, of Islamic law in the West. Flash: Fox Reports on Saudi "Mutawa"
Mayor Rudy Giuliani and Saudi Arabia's Alwaleed bin Talal, shortly before Giuliani returned the prince's check for $10 million dollars in 2001, four years before Alwaleed became the largest stakeholder in News Corp outside the Murdoch family. Ed Smith, who lost his wife Monica (right) and un-born son in the 1993 terrorist attack, said after the 19th anniversary ceremony, "I miss my wife and my son every single day." Today is the 20th anniversary. Personally, my horizons at the time were defined by newborn twins so I recall the event impressionistically and in a surreal light. But the event was surreal -- ghoulish, comic-book-crude evil -- and it set the standard for this age of jihad that the Western world resolutely refuses to face. About that SOTU: Did Anyone Realize Obama Was Working Off a New Constitution? My latest Dispatch International article is an analysis of President Obama's State of the Union address of February 12, 2013. The title my European editors gave it is, "President Obama Proposes New Constitution." An eye-catching headline to be sure -- although maybe what the president was really telling us is that he has already ratified his own new constitution and is busy enacting it. WASHINGTON, D.C. President Barack Obama opened his 2013 State of the Union (SOTU) address to Congress by quoting John F. Kennedy. Fifty-one years ago, JFK told assembled government leaders in the same ornate House chamber – the president’s cabinet, members of Congress, the twelve justices of the Supreme Court – that “the Constitution makes us not rivals for power but partners for progress”. Having refocused on the Obama identity fraud via the excellent essays by David Solway, it is also time to remind ourselves that the apparent fact that Obama is not actually eligible for the presidency, due to the fact that his father was a British subject, remains unaddressed by the courts and Congress. Last June, the indomitable lawyer Mario Apuzzo set out to argue the "natural born" issue as well as to present evidence that the online birth certificate is a forgery in a New Jersey courtroom. The judge prevented him from doing either, and Obama's eligibility for the New Jersey presidential ballot was affirmed. The syndicated column I wrote about the proceeding (reposted in full below) did not appear in either the Washington Examiner or Townhall.com, just to name two sigificant conservative sites that will not even permit coverage of the issue to sully their pages -- or appear before their readers. The Fox Effect, Pt. 5? On September 19, 2012, David Horowitz appeared on Fox News with Megyn Kelly to discuss the arrest of Nakoula Bassely Nakoula, the producer of "Innocence of Muslims," and, according to the leading members of the Obama administration, chief villain in the attack on the US compound in Benghazi on 9/11/12. Horowitz was in fine form, waxing outraged as the administration seemed to turn the screws on Nakoula and free speech itself -- a play, I would add, right out of the Muslim Brotherhood, OIC, Al Qaeda, CAIR, Muslim-"moderate" playbook to make the West conform to Islamic prohibitions against criticizing Islam. Making the point that our ambassador had just been "murdered," Horowitz points out at around 2:30 of the video here (hat tip Andrew Bostom) that the Justice Department was nonetheless focusing on the filmmaker. 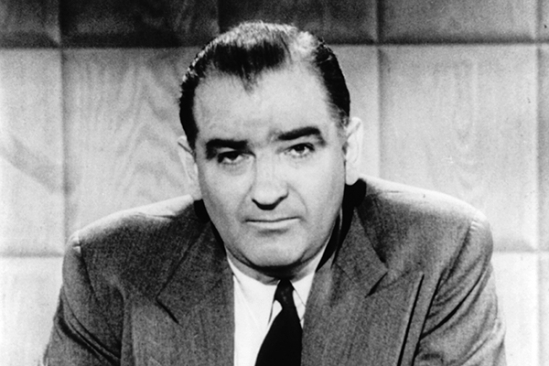 Time to Slay the Dragon of "McCarthyism"
I've begun taking whacks at the fire-breathing dragon of "McCarthyism" lately (beginning with this piece that ran in Dispatch International last month) as a terrorizing, paralyzing figment of Communist-derived conditioning -- an overall phenomenon I examine at great length in the new book, American Betrayal. Similar forces are today trying to twist our understanding and thus defense against another totalitarian ideology, Islam. The remedy is in the moral: If we can't face facts, we can't face anything. Listen to the noble-voiced British Ambassador to Egypt proclaim, in so many words, England's compliance with sharia. If anything, his Olivier-style tones make his submission all the worse. President Obama speaks to reporters about the online birth certificate White House officials uploaded on Wednesday, April 27, 2011. Below is an original essay by David Solway, but first an introduction. There are at least two basic ways to approach the signal, neutralizing event of American history. Before I present examples of both by a singular guest-author, I realize I first have to specify what that signal event is. Our non-recognition is testament to many things, not least of which is the event's almost anti-climactic nature. We might think of the event as only the most visible manifestation, like a sore or lesion, of an underlying sickness in American society that more intangibly has rejected morality, bankrupted the law, and devalued the Constitution. Maybe the shame of it all is why we pretend this manifestation isn't there. In the following interview, RadicalIslam.org National Security Analyst Ryan Mauro speaks to Diana West, a nationally syndicated conservative American columnist and author, about the impact of the partial ownership of Fox news by Saudi Prince Alwaleed. Ryan Mauro: You have devoted a lot of your time towards covering Saudi Prince Alwaleed Bin Talal. Can you tell us about him and why he warrants this attention? Behold The Mons Hall at Sandhurst, named to honor the thousands of men who died in the 1914 battle during World War I. Soon its name will change to King Hamad Hall to honor the money of the dictator of Bahrain. Wonder what will be named to honor that. How about changing Sandhurst to "Sandemirate"? Board meeting of Al Maktoun, a UAE charity. Are they writing checks for laptops for "needy" Americans? Yesterday, I tweeted, and somehow contemptuously, that London's mayor was seeking money for a new airport from Qatar, Dubai and Kuwait. Today, the Wash Post reports on the extensive charity the UAE is lavishing on "needy" American communities. I feel ill. Emiratis are the people who were falconing with bin Laden in Afghanistan when the US didn't strike OBL pre-9/11; these are the people whom we successfully rejected over the UAE's proposed Dubai Port's purchase of US ports. Now, they just buy their way in all over America with laptops, soccer fields and hospital beds. Below is my write-up from Dispatch International of jaw-dropping Senate testimony from both SecDef Panetta and JCC Gen. Dempsey that, following an initial briefing at 5pm on 9/11/12, neither President Obama nor anyone from his White House staff ever once checked in with either Panetta or Dempsey during the night and early morning of 9/11/12 and 9/12/12 while US personnel and interests were under attack in Benghazi. I have informally polled some experts and reporters (sometimes one and the same) as I have come across them since Panetta and Dempsey testified and they are roughly divided as to whether Panetta and Dempsey are telling the truth. Minibar's "dragon's breath" course is a curried popcon ball dunked in liquid nitrogen. Did the president eat it in one bite, as staff suggests, so vapor would stream from his nose? In case anyone is wondering what the Obamas' Valentine's Day dinner out at Minibar was like, here is a recent Barron's review of dinner for two, which came to $958. "A Bargain Dinner at $500 a Head"
At 6 p.m. on a rainy night this week, my guest and I sat down at the counter of Washington D.C.’s Minibar. Only six privileged guests at a time dine here on a 26-course meal handcrafted by Chef Jose Andres and his young staff. One of the most acclaimed restaurants in the country, there is no shingle announcing Minibar on the corner of E and 9th streets, just an anonymous frosted-glass door of the type I’ve previously seen at private banks on the Bahnhofstrasse in Zurich. But behind the door stands a hostess with iPad. She took us from the white foyer to an adjacent waiting room, where more smart-looking staff brought us a cocktail, hot towel, and a wooden box filled with seaweed-dusted rice crackers. Brennan: Jihad Apologist to Lead Fight Against It? We all know what happens when the fox guards the chicken coop – or do we? This is not a rhetorical question. Do we Americans understand what happens when a wily predator is custodian of defenseless clucks? Our state of psychological disarmament makes us unable to recognize even such an obvious threat. I can’t think of another explanation for why the country hasn’t melted down the Capitol switchboard with phone calls to U.S. senators beseeching them not to confirm John Brennan as the next director of the CIA. What’s so scary about Brennan, currently President Obama’s top adviser for counterterrorism? Larry Auster, author of the blog View from the Right, broke the very bad news to his readers almost in passing: given the discovery of "multiple metastatic lesions" in his brain, he is hoping to undergo treatment that, if successful, might give him "several more months of functional life before decline and death." Below is the transcript of an Australian Broadcast Corp. Lateline interview with Geert Wilders. Ever Wonder Why Islamic Nations Contribute Squat to Afghanistan? This is a graphic from p. 66 of the new quarterly report by the Special Inspector General for Afghanistan (SIGAR). It shows the 12 largest donors to the giant sucking sound known as the Afghanistan Reconstruction Trust Fund (ARTF) for the last nine months of 2012, which are also defined in the SIGAR report as "SY 1391." WND reports today on the news former Marine platoon commander, FBI swat team leader, and counterterrorism & Muslim Brotherhood expert John Guandolo broke last week on Tom Trento's Trentovision show*: that John Brennan, President Obama's nominee to head the CIA, converted to Islam while CIA station chief in Saudi Arabia. Despite media coverage of the Panetta-Dempsey Benghazi hearing best described as extra-terrestrial -- as in, what planet are these reporters on? -- several new pieces of information are now part of the record. They are not, however, part of the mainstream news feed. Geert Wilders: "No Compromise with the Truth"
Geert Wilders in Bonn, February 2, 2013. Video via Vlad Tepes. In this address, Geert reveals that a German publisher translated Geert's excellent Regenery book Marked for Death (2012) into German only to learn from the firm's lawyers that the publisher would face criminal prosecution for bringing Geert's book out in Germany as written. Such is the repressive nature of German law under the influence of the twin totalitarianisms, Marx and Islam. "For example, when in the English edition I criticize Islam and say truthfully `Islam,' the German edition can only read "Islamism," or "orthodox Islam," or "sharia-Islam," or whatever may be the case. He is well, he is in an undisclosed location, he is back to work. Not bad for a 70-year-old man who was fired on "from less than a yard" away" while collecting a (phony) package delivered to his home. Far from stopping Lars, the gunfire triggered Lars's life-saving right hook to the gunman's face ... (see column below for details). I asked Lars yesterday if he knew more about his 25-year-old assailant. He wrote: "He is an immigrant from a Muslim country – Arabian or Pakistani. There is no doubt. You may quote me." The gunman is also half a century younger than Lars. It suddenly struck me, as I reflected on the violence that Islam has brought into Western society: The heroes of the Danish counter-jihad are elderly men -- old Vikings, it turns out, but "senior citizens" by any measure. Westergaard, Hedegaard, Sweden's Lars Vilks (b. 1946), too, an artist whose life is also imperiled by Muslims for his drawings and beliefs -- are all men of advanced years. They are also all men of the pen and paint set. Writing at Frontpagemag.com, Bruce Bawer discusses Scandanavian press coverage of yesterday's attempt on the life of Lars Hedegaard. A veteran Danish journalist and historian, Hedegaard is editor of the new weekly newspaper Dispatch International, for which I am DC correspondent. I invite readers to visit our English-language site where all content is free this week in view of the apparent jihadist attack (with a gun) on a lion of liberty (who uses a laptop). Danish free speech advocate and critic of radical Islam, Lars Hedegaard, survived an assassination attempt by a gunman Tuesday at his Copenhagen home. Hedegaard’s partner, Swedish journalist Ingrid Carlqvist, told TheBlaze that the young man appeared to be of Arab descent and that she and Hedegaard are certain the motives for the attack stem from the launch of their new weekly newspaper, “Dispatch International,” which contains content critical of radical Islam. Hedegaard was shaken but not physically injured in the attack at his apartment, where a gunman, posed as a deliveryman, rang the doorbell under the pretense that he had a package to deliver. When Hedegaard opened the front door, the man pulled out a gun and began firing. An "Arab"-looking assailant just tried to take the life of my dear friend and editor Lars Hedegaard today at his home in Denmark. The assailant fired shots and missed. 9:24 EST: Danish radio reporting police are evacuating neighborhood and will detonate something. Regarding my last column, my friend John Bernard of Let Them Fight writes in to remind us of another result of our ride on what he calls the "bullet-train to `equality.'" Watching yesterday's morning session of his Senate confirmation hearings on C-SPAN made me nothing if not uneasy. There are, I have to confess, aspects of Hagel's foreign policy that intersect with my own beliefs: those that stem from his apparently sincere drive not to see US troops wasted in foreign interventions that have nothing to do with American interests. I am alarmed, however, by his apparently visceral and unveiled attitudes toward Jews and Israel, which dovetail with the Arabist worldview. Such a worldview, it should be noted, is not that dissimilar from that of Gen. Petraeus (see here, here, here, here) with the one crucial exception that has commanded the (misguided, I argue) support of all manner of pro-defense Americans: Petraeus has devised and applied the bloody-disastrous COIN strategy to fight/nation-build/bribe/Islamize to address the situation. Hagel for his own reasons would like to pull back from that strategy. It is in that immediate cessation of fighting and nation-building where I agree with Hagel.